Despite the fact that Stephen Spiegel portrays a character named Booth, the actor does anything but phone his performance in. Indeed, Spiegel kills as America’s archetypal assassin in An Evening with John Wilkes Booth. Co-written (with Clinton Case) and directed by Lloyd Schwartz, this one-man show explores the co-conspirator who shot Pres. Lincoln as a celebrated actor, ladies man, individual and, oh yeah - as a homicidal maniac and drunken sot. Upon entering Theatre West, a recording of “Dixie” was played to set the mood - it’s certainly a very catchy tune, especially if you happen to be a neo-nazi. Along with some racial slurs, this - plus the delirium of a megalomaniacal murderer eloquently spewed by Spiegel - are among the challenges 21st century theatergoers must endure to experience this excursion into the mind of the man who murdered Abraham Lincoln, arguably our greatest president. Be that as it may, with his dashing good looks, the mustachioed Spiegel - who resembles Errol Flynn during his heyday - embodies Booth, that scion of a 19th century thespian family, who put the “nasty” into dynasty. In Act I we observe Booth’s elocution as he recites Shakespeare and poetry - plus this madman’s meandering, meshuggeneh musings and ramblings. Although proud of his famous father and brother, John was also envious of the fame and acclaim of Junius Brutus and older brother Edwin, and JWB’s diva-like vanity provides some mirthful moments. The proud-as-a-peacock John enjoys the intimacy afforded by the 19th century’s equivalent of groupies, because Booth did have a rock star caliber notoriety he exploited to the hilt. The Marylander’s stage stature also gave him access to Ford’s Theatre, where John had previously performed many times - and where he’d execute (literally) his most infamous performance on April 14, 1865, cowardly shooting Honest Abe in the back of the 16th president’s head. Act II focuses on the dirty deed and how Booth played a pivotal role in a conspiracy that was also intended to topple the Union government only days after Gen. Robert E. Lee’s surrender at Appomattox Courthouse to Gen. Ulysses S. Grant, by also liquidating Grant, Vice Pres. Andrew Johnson and the Secretary of State (William H. Seward survived five stab wounds by one of Booth’s accomplices). Unlike Lee Harvey Oswald - who the Warren Commission and other liars would hoodwink us into believing was the putative “lone gunman” who shot JFK - even if Booth was the ringleader, he was very much part of a conspiracy. My main quibble with this otherwise excellently acted, directed and written play is that it needs just a few more lines to paint portraits of Booth’s co-conspirators and what they tried to carry out. Andhow being Junius’ born-out-of-wedlock son may have affected John is also not dealt with (well, after all, he is the one telling his version of the story, so what should we expect from this egomaniac?). But these historical oversights definitely should not deter viewers from attending possible future productions (which this one-person show definitely deserves, and there is an aud for it). As great as Honest Abe was he made at least one disastrous political mistake, which was to choose as his running mate the Southern-born Johnson. Once he succeeded Lincoln as president this racist pig stymied the Radical Republicans’ Reconstruction plans, which set the stage for his impeachment. That’s another story, but it’s relevant here because Booth’s desperate deeds unleashed a chain reaction that thwarted the liberation of the newly freed enslaved people. This is an issue we are still wrestling with, and in this sense Booth was successful in his secessionist, white supremacist insanity. Thus, as this period piece reminds us, from Charlottesville to 1600 Pennsylvania Avenue, Booth’s ghost still haunts us. Co-writer Schwartz produced and scribbled Gilligan’s Island and Brady Bunch sitcoms, and is also the award-winning bard of 43 plays. The fact he co-penned the historical, politically-minded, serious Evening lends credence to assertions made in the documentary (or was it a mock-umentary?) The Gilligan Manifesto, that the popular comedy was actually a coded chronicle commenting on the Cold War and communism, albeit in a lowbrow humorous way. It’s interesting to note that this bio-play about America’s archetypal assassin emerges at a time when we suffer under the reign of an enormously unpopular commander-in-chief and would-be tyrant. During the presidency of George W. Bush - another pig who lost the popular vote, but stole the Oval Office - there was a spate of novels, plays, movies obsessed with political liquidations. Sean Penn, a symbol of resistance to the Iraq War, starred in no less than four assassination-themed feature films during Bush’s occupying of the White House: 2004’s The Assassination of Richard Nixon; 2005’s The Interpreter; 2006’s All the King’s Men; and 2008’s Milk. In racists’ favorite film, D. W. Griffth’s 1915 The Birth of a Nation, in an admittedly exciting assassination scene, John Wilkes Booth was depicted by Raoul Walsh, who went on to become one of the most legendary directors during Hollywood’s Golden Age. 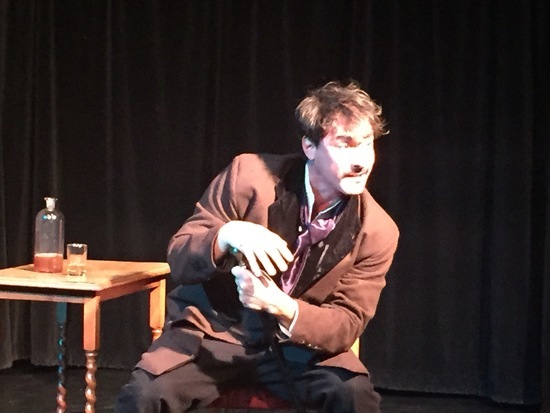 An Evening With John Wilkes Booth was presented for one night only (although it merits a theatrical run) as part of a season of solo performances at Theatre West entitled Portraits of Humanity 2. The solo series, produced by Dina Morrone, was launched last October by the inimitable Ian Ruskin, in a one-man show about ILWU labor leader Harry Bridges. The next performance in the series features Abbot Alexander in The Lycanthrope on Saturday, Jan. 26 at 8:00 p.m. at: Theatre West, 333 Cahuenga Blvd. West, L.A., CA 90068. For info about this Festival of one-person shows: http://theatrewest.org/onstage/portraits-of-humanity-2/ ; (323)851-7977.